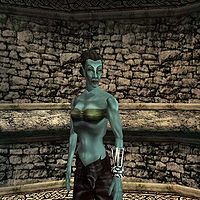 Adusamsi Assurnarairan is a Dunmer priestess and Oracle for the Imperial Cult, who is currently being held as slave in the Rotheran Arena. Her captors have taken away her clothes and ring. The ring is particularly valuable because it has a Divine Intervention enchantment on it which she could use to get out. When you approach her during the Ice Blade of the Monarch quest, she'll take the ring and do just that. Oddly enough, however, she'll let you keep the robe, which has a Paralyze on Target enchantment. Apparently freedom trumps dignity. After she teleports away, she is disabled from the game. Before she disappears, she offers medium training in Mysticism, Alteration, and Restoration. She only wears expensive pants and a slave's left bracer. Aside from her natural resistance to fire and the sanctuary provided by her ancestors, she knows no spells. Ice Blade of the Monarch: Find this powerful blade in the stronghold of Rotheran. "Please. Llaren Terano is a sorcerer and worshipper of Molag Bal. He is a terrible sorcerer, but he also carries a deadly sword. He stripped me and made me his prisoner. That's all I can remember. I can't recall how I got here, or why. I think he has poisoned my mind with spells. If you can recover my ring from Llaren Terano, I can use its enchantments to escape. Please, rescue these slaves, too, if you can. Llaren Terano has their slave key. Bring me my ring. Please." Goodbye. "Bring me my ring! BRING ME MY RING!" Goodbye. "Yes! That is my ring! Please! It grants me Divine Intervention! Now I can escape! Give it to me NOW! I don't care about anything else... just let me out of here!" Goodbye. This page was last modified on 19 April 2016, at 16:39.